THE sand whiting is a widely distributed species found throughout most of Australia’s coastline and is one of the most popular fish to chase in coastal estuaries and along the surf line. In recent years most of the fishing press in relation to this species has been about catching whiting on surface lures, a rather strange idiosyncrasy of this small bottom feeding fish. There are many ways to catch these great little fish, and in general bait is a much more reliable option than lures. In southern Queensland, where I live, whiting are probably the most popular summer species in our estuaries and on the beaches, and this is largely due to their superb eating qualities. Whiting have quite a unique taste, sweet and delicious despite the many bones that may be encountered. On light tackle whiting fight hard for their small size. Any sand whiting over 40 cm long is a great fish, and a whiting that weighs a kilo is a bit like a metre flathead. They exist but are quite rare, and are one fish in many, many thousand! A lot of the more successful whiting methods are distinctly old school; they haven’t really changed in many decades. I often watch a couple of older fishermen in the creek near my house. They anchor up in the same place every Saturday on the first of an incoming tide, have long rods with the tip section painted white and fish under the shade of a big straw hat. They have two rods each. Every 15 to 20 minutes one of the rod tips moves, and another fat whiting is pinned, fought and put in the esky. 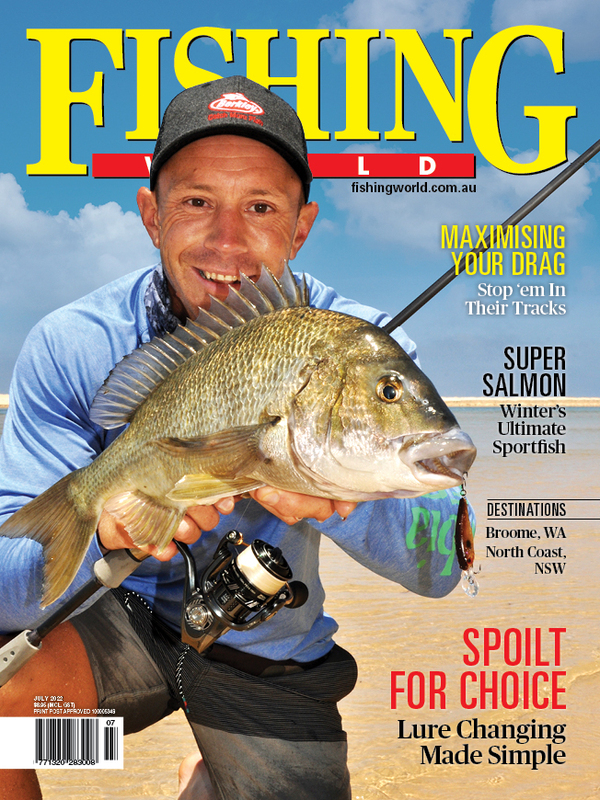 While they do get a few annoying bream, nearly all the fish they catch are plump fat sand whiting from 30 to 40 cm long. They use blood worms for bait and Alvey reels on long quite sloppy rods. It does, from a distance, look quite easy, but the many times I’ve tried I can’t repeat their sustained success. It's all about the bait. Many good whiting anglers spend as much time getting their bait as they do fishing. A lot of serious whiting anglers spend as much time getting their bait as they do fishing. Digging up blood worms can be back breaking work but is the best way to get absolutely prime bait. Shrimp, jelly prawns, small soldier crabs and wriggler worms are also “A” grade baits. Yabbies are very effective in certain situations, frozen prawns are a poor option and beach worms are great on the beach but not so reliable in the estuaries. Whiting have a small down slung mouth and feed on the bottom most of the time. While the mouth is small, sand whiting are extremely fast and aggressive predators. If they disturb a prawn they chase it down, which probably explains why they will attack a small surface lure with ferocious intent. They swallow their prey whole, as they have no teeth, and seem to have quite brilliant eyesight. If you intend to bait fish for whiting you need to plan your bait collecting prior to fishing and in general a session starts with bait collecting on the bottom of the tide and then you fish this bait on the run in tide as the water pushes up over the flats. Whiting fishing is always at its best with a fair bit of current flow. There are two distinct areas to chase whiting in most estuaries, the sand and mud flats and the deeper channels. In estuaries where there are open expanses of flats, the water will constantly fill and then drain the areas where most of the invertebrates that the whiting feed on. These are best considered as ‘in and out’ areas. In a more defined river with no flats on the edges, the water goes ‘up and down’. In this situation the whiting tend to stay in the main channels and edges of weed beds feeding on different baits such as small shrimp. The Nerang River on the Gold Coast is a good example of an “up and down” system, where the width of the estuary is contained within the river banks regardless of the tide. This distinction is important as it governs how you should fish each type of estuary. One surprising thing in the more defined rivers is that whiting fishing is often at its best at night. Any sand whiting over 40 cm long is a great fish. There are many ways to fish the flats, but one of the most exciting methods, using bait, is to sight cast the fish as you walk the flats. My good mate Ross McCubbin has made an art form of sight casting whiting using yabbies for bait. Using a long, light rod with ultra-fine 2 pound braid and 3 pound fluorocarbon leader he catches consistent catches of big solid sand whiting. Tide is important. As the push of a run in tide begins, the whiting start to move up onto the flats. By getting down wind, and using a good pair of Polaroid sunglasses, it is usually pretty easy to spot the schools of fish moving up on the flats. These fish are keen and feeding. The rig consists of a small number 6 Aberdeen or similar hook and no lead is used. An unweighted yabby on an ultra-light outfit can be cast a reasonable distance. The key to this method is being able to spot schools of whiting, and work out where the bigger fish are. This is not easy, and a good pair of Polaroid glasses is a big help. Whiting often show themselves as a series of flashes as the fish turn and move. Once whiting are spotted, cast the yabby in front of the feeding fish. In general they will rush the bait. This method is best done by wading and is incredibly productive most days. It tends to work better with a slight to moderate breeze and a bit of cloud cover. The key water depth is between about 20 and 60cm of depth. Worms and small soldier crabs can also be used but are far inferior to yabbies. It's important to give the fish plenty of time to take the bait. This method also produces quite a few big flathead that either eat the yabby or swallow a whiting once it's hooked. Catching an 80cm plus flathead on 2lb braid and 3lb leader is a real challenge! Fishing from an anchored boat requires different tactics. Whiting are a small fish that fights really well, but they have no teeth and you can use the lightest tackle possible to chase them in most situations. This gets you more bites and accentuates the great fighting qualities of these scrappy fish. When fishing deeper water from an anchored boat there are a few factors to take into account. While the schools may travel in the same direction as the current, they generally begin feeding by working into the current, staying close to the bottom. What this means from a bait fishing perspective is they often pick up a bait and slowly swim towards you, making the bite quite hard to detect. The bite can be a slight bump, or the line may appear to go slack. With experience you can pick most bites, but in general watch the line carefully and strike at any decrease in tension. Bream tend to rattle a bait and are easy to pick. Whiting are much more subtle. Longer softer rods are the most effective style of rod for most whiting fishing. In my local water a lot of the keener whiting anglers paint the last metre or so of the rod white. This makes detecting bites a bit easier, particularly at night. Whiting also occur in prolific numbers along the surf beaches of our coastline where they feed on beach worms, small pipis and other invertebrates. They are a species ideally adapted to life in the surf zone, as their strong compact thin shape lets them cope well with the constant turbulence. 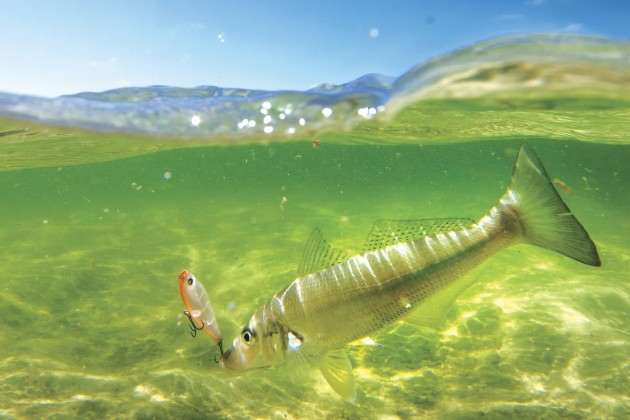 Unlike the subtle bites of a whiting in deep water, the bites in the surf are quite sharp and aggressive. Beach worms are the most reliable bait in the surf, and once again light line and leader get the most bites. In general you don’t have to cast far in the surf to catch whiting, and they often feed in the shore break right at your feet. On most beaches the key is to find an area with plenty of pipis and beach worms and fish the period from about an hour into the run in tide up until high tide. A gutter running parallel to the shore with plenty of white water behind it usually works well. Use just enough lead to hold the bait in position and in general surf of about half to one metre in height produces the best fishing most of the time. Over the past few years there has been an ever increasing interest in catching whiting on small surface lures, and this is probably the most fun and interactive way to chase these great little fish. I never thought that whiting would be the type of fish to be such an aggressive predator on a surface lure. When I first heard of this method I was extremely sceptical, and dismissed it way to early. From what I understand the pioneering work of whiting on surface lures was done by Kevin Gleed on the south coast of NSW Since this early work the method has become very popular in many estuaries. To catch whiting on surface lures you need a spot where shrimp and prawns are a regular part of a whiting’s diet. Prawns are great food but they are not that easy to catch, especially if you are a little fish with a small underslung mouth and no teeth! 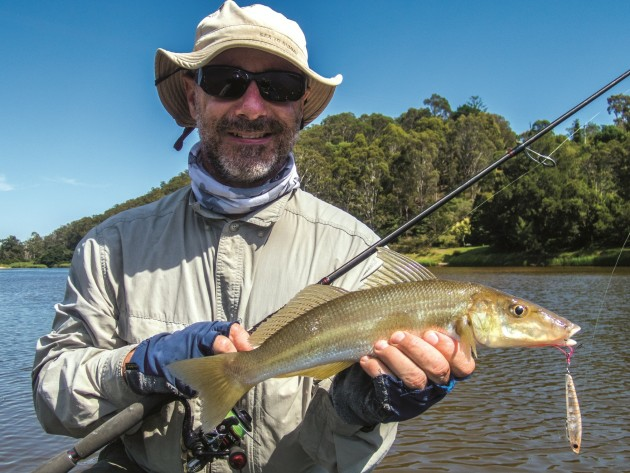 But in order to catch a fleeing prawn skittering across the surface you need speed and ferocious intent, and that is why you can, with practice, catch whiting on surface lures. There are two basic approaches to this, stick baits and cup faced poppers. 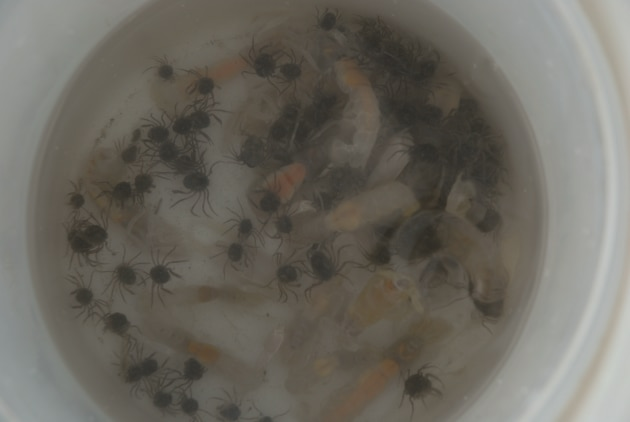 The key to success is to retrieve quite quickly and make the lure spit water, imitating a fleeing prawn. I like to use both lure styles and each will work differently according to the prevailing conditions. My overall favourite stick bait for whiting is the Bassday Sugarpen. These expensive little beauties seem to me to be better than every other stick bait I’ve tried on most occasions. A bigger lure that is also very effective is the Luckycraft Sammy. 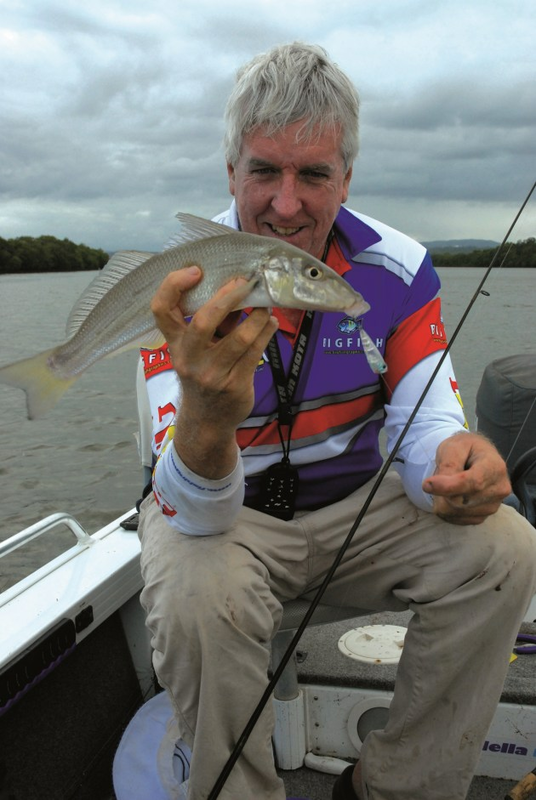 Clear coloured lures seem to be the best most of the time, and is a good match for most prawn and shrimp species. Poppers also work well, particularly when there is a bit of wave action. The small Rebel Pop R is a great whiting popper. With both lure styles the best retrieve is a fast wind with plenty of rod movement to make the lure spit a few beads of water in front of it. If you’ve watched prawns skittering across the surface you will soon get the idea. Whiting usually appear behind or close to the lure as a small bow wave. They rarely break the surface before you hook them. When you see a fish following keep winding. If you slow the retrieve down the fish generally veer off and disappear. If the whiting are schooled up in numbers they can be quite competitive in their efforts to get the lure and these are the times you will get good catches. In general though, you have to work for your fish. The success or failure of this method seems directly proportional to the amount of prawns or shrimp present in the estuary at the time, and some places produce great surface lure fishing for whiting for this very reason, whereas in other places it can be ineffective and frustrating. The enemy of the expensive Sugarpen is the tailor, and on the flats at times bite-offs can occur all too frequently! Overall, whiting are a great fish to chase on the estuaries and beaches, and while lure fishing is fun, it pays to remember if you want a feed of fresh whiting fillets, good live bait that you’ve caught yourself is very hard to beat. Whiting fight hard for their size.